MIGHT BE THE LAST !!! FUN TRIVIA QUIZ & TWIST. PARFECT BALANCE OF KNOWLEDGE AND FUN. THE SURPRIES ELEMENT IN THE GAME. THE ‘QUIZ KING’ BY WINNING THE CROWN. Product Description HURRY UP A QUIZ GAME OF KNOWLEDGE AND SPEED THINK FAST TELL FAST OR ELSE YOU MIGHT BE THE LAST !!! 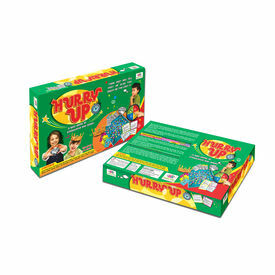 WHY LET CHILDREN TURN INTO COUCH POTATOES WHEN YOU CAN CANGAGE THEM IN THIS SUPER – FUN GAME CALLED “ HURRY UP” ? 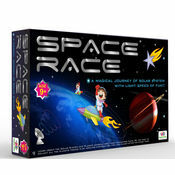 THIS EXCITING BOARD GAME PROMISES ‘A TOTAL FUN EXPERIENCE’ NOT ONLY FOR KIDS, BUT ALSO FOR ENTIRE FAMILY. THIS GAME PUTS YOUR OBSERAVTION TO THE LEST, WITH SOME FUN TRIVIA QUIZ & TWIST. EACH CARD POSES THREE QUESTIONS, FROM DIFFERENT DAY TO DAY ACTIVITIES WHICH NEED TO BE ANSWERED IN 3 MINUTES. THE GAME BOARD HAS BEEN DESIGNIED IN SUCH A WAY THAT THE GAME IS A PARFECT BALANCE OF KNOWLEDGE AND FUN. 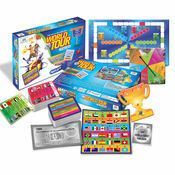 THE QUESTIONS HAVE BEEN SELECTED FROM A WIDE RANGE OF TOPICS LIKE FAMOUS CONSUMER BRANDS SPORTS & ENTERTAINMENT HISTORY MATHS GEOGRAPHY GRAMMAR FESTIVALS FOODS PROFESSIONS THE CHANCE CARD MOVE CARD & CRAZY CARD ADD TO THE SURPRIES ELEMENT IN THE GAME. THE KEY TO WINNING IS ANSWERING GIVING CORRECT ANSWERS OF MAXIMUM NUMBER OF QUESTIONS IN THE GIVEN TIME FRAME. COLLECT MORE NUMBER OF DIAMOND AND BECOME THE ‘QUIZ KING’ BY WINNING THE CROWN. REMEMBER , THINK & TELL FAST – ELSE YOU MIGHT BE THE LAST !!! SO GOOD LUCK TO YOU ALL AND HAVE A GREAT QUIZZING TIME !!! IMPROVES GENERAL KNOWLEDGE & SHARPENCE OBSERVATION SKILLS. 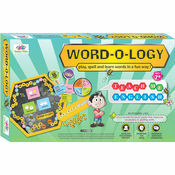 GAME BEEN DESIGNED BY PROFESSIONAL TOY DESIGNER KEEPING IN MIND THE AGE GROUP, INTEREST OF CURRENT GENERATION AND IS A BEAUTIFUL BLEND OF DIFFICULTY LEVELS SO THAT THE GAME IS CHALLENGING AT THE SAME TIME VERY ENTERTAINING . QUIZ TOPICS AND QUESTION HAVE BEEN CAREFULLY SELECTED. 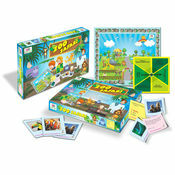 THE TIME BOUND FEATURE OF THE GAME ALSO HELPS IN SHARPENING THE LITTLE BRAINS AND MAKES THE GAME EXCITING. 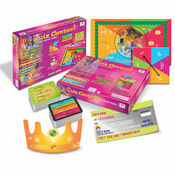 CONTENTS: JAZZY GAME BOARD, 96 GAME CARD WITH 288 QUESTIONS, ANSWER SHEET, CRAZY CARDS, MOVE CARDS, CHANCE CARDS, DIAMOND CARD, SPINNER BOARD, TOY CROWN, INSTRUCTION SHEET IN HINDI & ENGLISH.